We are finished with Thanksgiving . That means… Uh Oh! The heat is on to find the best holiday gifts. To begin with, I love giving gifts of beauty. Even more, I love this time of year because it is when all of the Holiday makeup and skincare sets are available. So, I’ve purchased a variety of sets ,to wrap up, from some of my favorite brands. 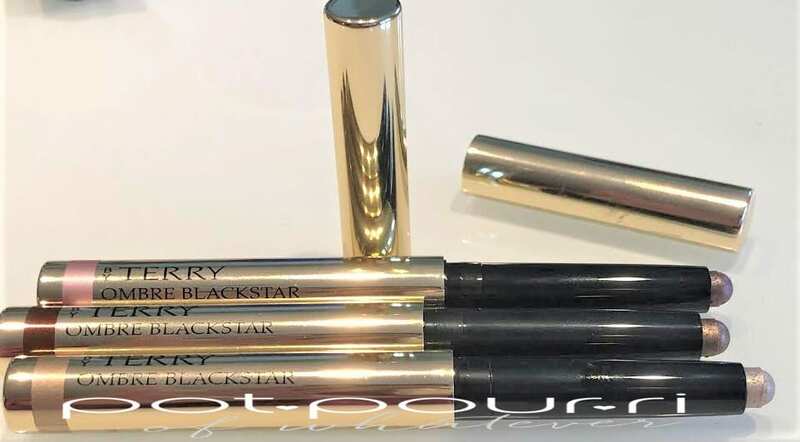 The ByTerry Glam Glow Ombre Black Star Set is one of them. I want to gift this set to someone who loves luxury products. In this case, ByTerry is that luxury brand. 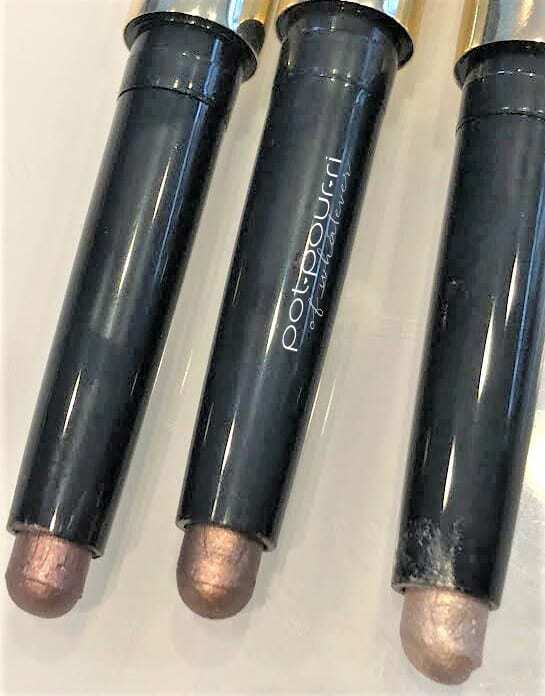 This set has three creamy shades of eye shadow in stick form. First, the creamy eye sticks are easy to use, they perform well, and they give you numerous results. You can find ByTerry Limited Edition Glam Glow Ombre Black Star at Beautylish and Space NK and Dermastore. The Limited Edition Ombre Black Star Set retails for $95. It’s holiday season! 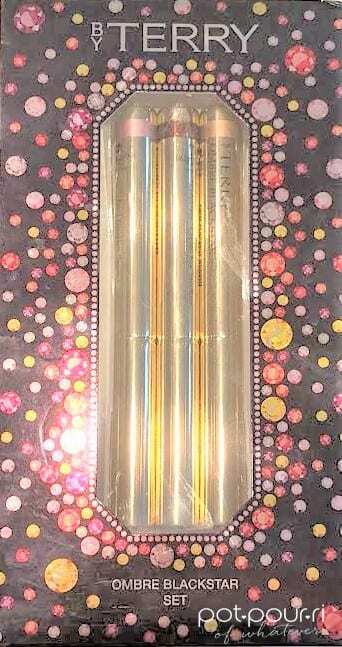 Therefore, the packaging for the Ombre Black Star Eye Sticks Set is festive! The box has gemstones all over it. Also, the gemstones are different colors. And, they are different sizes, from large to small. There is a clear window where you can peak in and see the three eye shadow sticks. 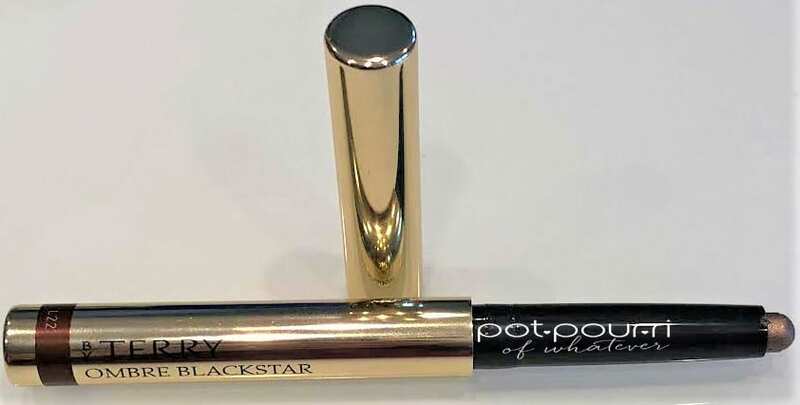 By the way, I love using an eye shadow stick. It is easy to use. Also, it is quick. And, when you are on the go, you can swipe it on anywhere! The sticks are gold metal. Remove the cap, and twist the bottom to raise the stick. When you want to put it away, turn the bottom the opposite way. Also, make sure you put the cap back on, tightly so the shadow doesn’t dry out. I like that the shadow is the perfect size to get to the inner corner of your eye. Also, the shadow keeps its rounded shape. Therefore, it is perfect for lining your lower lash line. There are some luxurious ingredients in the formula. How about, Tahitian Black Pearls! Did you know, the Tahitian black pearls work to create luminosity and make the eye lids smooth. Other ingredients include Beeswax to keep the shadow in place and give it long wear time. In addition, the formula is waterproof. Once those shadows set on your eyelids, they aren’t going anywhere!!! 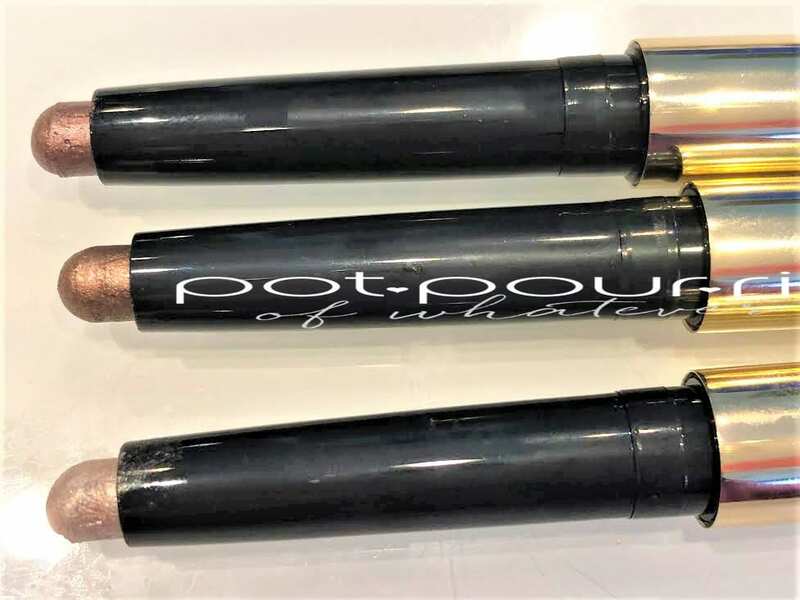 No, they won’t smudge and smear. In addition, Rose Essential Wax allows the creamy formula to hydrate your eye lids. As a result, the shadow feels comfortable. Also, the rich pigments allow you to create a line with one stroke. However, for more drama, the coverage is buildable. Last, other ingredients include Mica, Vitamin C , Vitamin E and Titanium Dioxide. The three shades, Blond Opal, Bronze Moon, and Misty Rock are not new. However, they are three of the best sellers in the line. Blood Opal is an opalescent cream shade with a shimmer finish. Bronze Moon is a copper bronze shade with a shimmer finish. Misty Rock is a silver lavender shade with a shimmer finish. First, for the perfect eye liner effect, draw the line from the root of your eyelashes. Also, you can color your entire eye lid if you use your fingertips. For a quick, smokey effect, bring the color all the way to the eyebrows. And, you can mix the shades to create your own. 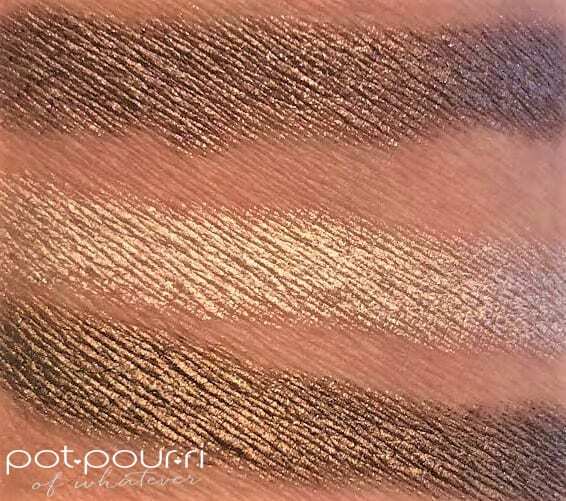 Additionally, for a metallic effect, you can apply the shadow directly to your eyelid. On the other hand, you can sheer the color out using your fingertips. Eye Sticks are a convenient way to apply eye shadow. ByTerry ‘s formula is so creamy, the shadows glide on with ease. Once it dries, the shadow feels like a powder. However, when you touch it, nothing comes off. The only downside can also be looked at as an upside. Once it sets, its not going anywhere! I think that’s a good thing. Try not to make any mistakes!LOL You’ll be stuck with them! Although, that’s hard to do with a shadow stick! Do you use shadow sticks? What do you like about them? What don’t you like about them? Let me know what you think in the comments box below. Or, just stop by to say hello!